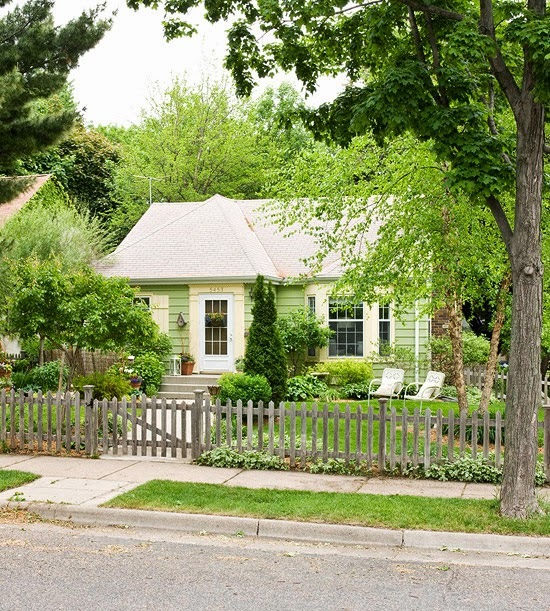 Isn’t this just the cutest little green cottage surrounded by a weathered picket fence? I was over at BHG.com, a place I really love for inspiration, and came across this little gem. First, there is the picket fence in front. What young girl didn’t want a house with a picket fence when they grew up? Well, most wanted a white picket fence. But we’ll take the natural rather rustic look. Inside is a cozy living space with lots of natural light and hard wood floors. The two neutral chairs look perfectly placed in this little nook. 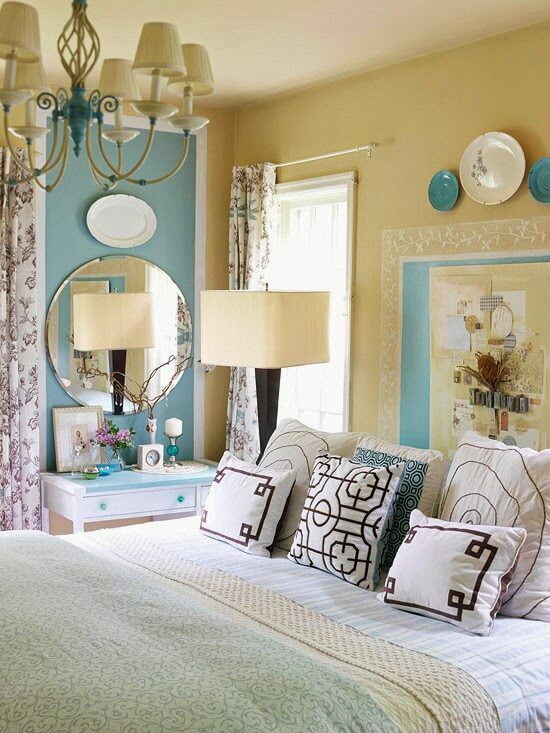 The blue lanterns hanging down from the ceiling is a sweet touch and also brings a bit of color to the space. 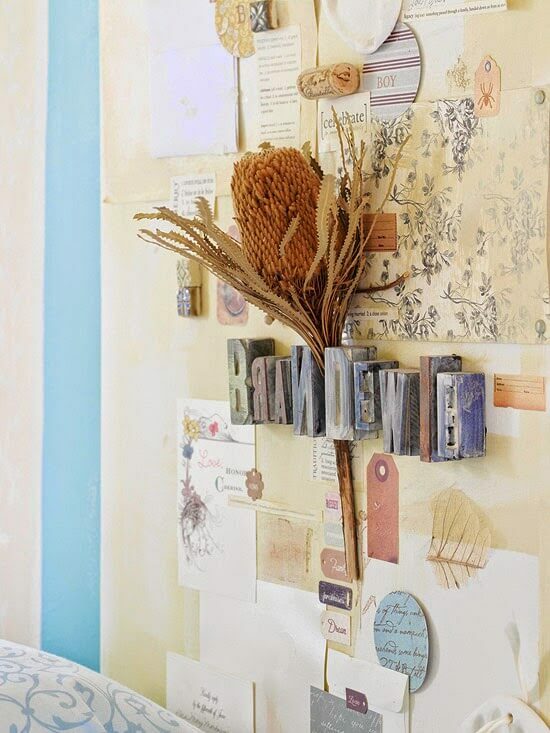 You can create a decorative display with most anything. In this beautiful blue bowl are round balls of various colors. The bowl brings a touch of whimsy to the space, as well as color. But this has to be my favorite thing about this cottage. 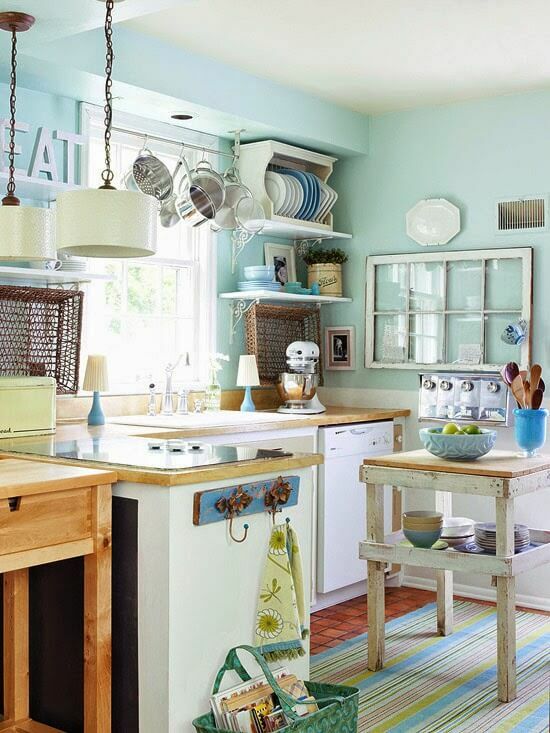 A flea-market style kitchen. I love everything about this eclectic room. What a cozy little spot! Here is a little office/studio space. This is very good use of a small space. It has everything the resident needs without making the space look cluttered. When you add glass to whatever you’re using as a desk or work space, you don’t have to cover the entire expanse. You can add a smaller piece of glass to highlight certain areas. 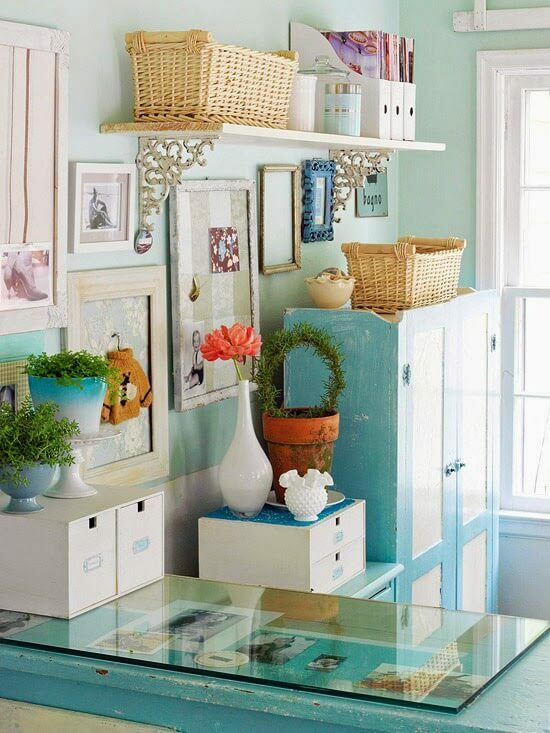 Baskets are always a wonderful way to store what you need. They bring texture to your space. The bedroom is a mish-mash of colors. But it all works together. As do the various patterns used in the pillows and bed linens. I love the collage of inspiration on the wall. It is a work of art in itself and is visually interesting. I'm Brenda, founder and creator of Cozy Little House. I'm so glad you came to visit. I love this cottage so much! I could just move in there! It's kinda my dream home! I stumbled upon this in their archives and it just blew me away! I really like all these photos. 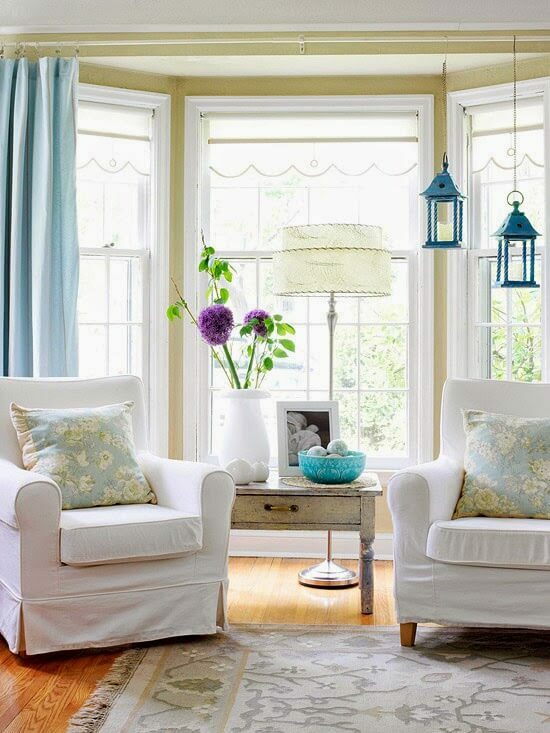 Love the lanterns hanging from the curtain rod. I haven't seen that idea before. The little cottage is just too cute. You know I didn't even notice the lanterns! So much to look at. I'll look now. How silly of me. I did see them. THOSE lanterns. Yes, those are just precious there. This cottage is so adorable! I love the use of color and all the details. Perfect! Wish my home was this well decorated. It can be. And on a budget. My neighbor Charlie had not seen my kitchen. I only know him around here. He saw it today as I was coming in and he was walking his dog, Sammy. I think it kind of shocked him. Very charming! I love the little nook with the two upholstered chairs in front of the windows. Sweet! Every photo I saw, I just thought: How sweet is this? Thank you, Susie. Yes, this would be my dream house. Small, cozy, cute. That little cottage is so cute. I love the color, landscaping and the window in the living room.. The lanterns caught my eye.. Could you do something like that with your Mason jars ? Even this kitchen has more counter space than I do.. I have an old window like that one but don't have wall space to put it on.. It's out on my deck now. Oh it is absolutely darling! I'd have it different inside if it were mine, but the outside is perfection. You share the neatest stuff! Thank you!! I simply love the cottage style houses; reminds me of days gone by. The kitchen, how sweet! I'd love to be able to find a table like the one in front of the dishwasher. Our kitchen is small, and needs a tad more counter space. oops! I just left an apartment comment on the Welcome Wagon post, instead of here. Must have scrolled past or something. This is a cute cottage. I love all the beautiful shades of green and turquoise in this cottage. It is totally charming and love the natural light from all those windows! I love that house too! So cute. 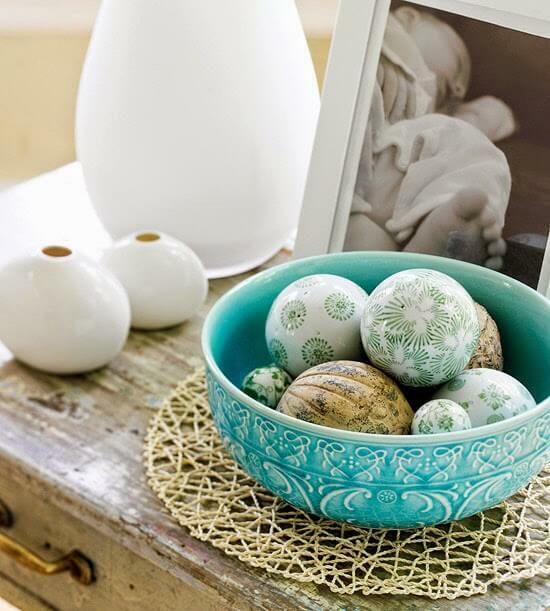 I love all the blue and white mixed with flea market finds. Love it…the kitchen has the same style and feel as yours. I really love this cottage, too, but the kitchen … oh my, the kitchen!!! And the office space! Love it all. Thanks for sharing this. Nice post! I will follow your blog as my pattern for decorating my kitchen cabinets next week! Thank you for sharing! Looks like an ideal place to live. Who wouldn't want that picket fence? I love this cottage. I especially love the cozy, sunny sitting area with the two chairs. Makes me want to sit and quilt or read and soak up the sunshine. This certainly is very nice, but I think your kitchen should be the one featured in better Homes and Gardens!!!! I do love this cottage. But, what's with all the pastels? I like bright and cheery. I have a thought for the forum discussions. Maybe you have thought of it or maybe not, so I decided to bring it up. I know on Facebook there are forums. They can be public or made into private groups. In order for someone to join the moderator (you) has to give approval. Just a thought. It's gorgeous! I could move in tomorrow. I like that phrase of yours, 'flea market kitchen' – it sums up the style so well. Brenda…someone in a past post said they like the blog to be 100% Brenda and her decorating. ..now I love your decorating but I also love what you show us in others homes too because what you show us is an extension of what you like. To be 100% your own home would just be too hard. Just keep doing what you are doing and we'll keep reading. . Darling cottage! The kitchen is my favorite area, so charming! I think it's adorable! I looked for it oh BHG but couldn't find it…do you by chance remember where it was? Oh my goodness..this is so full of inspiration for me. I think I can pin just about every picture…so glad you posted this..thank you.. I like rainy days and thunderstorms at night. I love the warm young days of springtime, when I plant my container gardens of veggies, herbs and flowers. And of course I cherish my Charlie Ross and Ivy Lou. Please be kind with your comments. This is a site for positive discussion. If you don't have something nice or constructive to say, please refrain from saying it. Comments that are hurtful or that disparage others are not welcome and may be deleted.